Undoubtedly the most comprehensive book yet published on the fascinating subject of inclusions in gemstones... Aesthetically and scientifically satisfying. 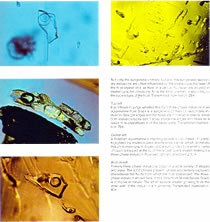 Photoatlas, Volume 1, first published in 1986 and now in its fifth printing, has become a standard reference in the gemological field. 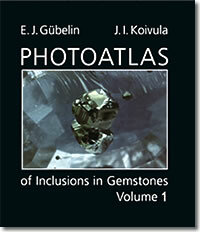 Dr. Eduard J. Gübelin and John I. Koivula collaborated on this book, producing an exhaustive resource on the geological paragenesis of gemstones, as well as the physical, optical, and chemical properties of gemstones and their guest inclusions. Three distinguished mineralogists contribute essays on specific topics related to the genesis of gemstones. 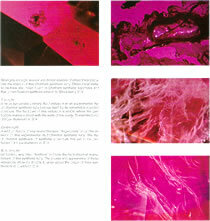 Each chapter contains information on the micro-characteristics of natural gemstones, synthetic and treated host materials, along with a complete selection of photomicrographs and a suggested reference section. Hardbound, 10 x 8.75 x 1.25, shipping weight 6 lbs. Powerful diagnostics of process and the contagious appeal of sheer aesthetic delight ...color photography of beauty, fantasy, and meticulous detail. 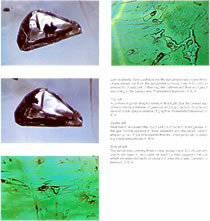 This is fascinating reading for anyone interested in mineralogy. 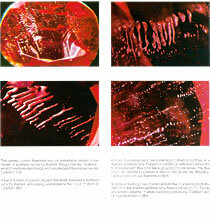 In spite of the authors obvious artistic appreciation, the book is convincingly scientific. “It is, by the way, expensive only if you think of the money. Think of the book and it’s cheap.